For the most part I think we all feel that we have a firm grasp of how video games work. Every game has a clear objective that the player has to achieve. This could be anything really - solving a murder-mystery, killing hordes of zombies or performing a cool guitar solo. There are games for almost every purpose all following this general format. And then we get to the stranger games developed by the likes of Thegamecompany, the folks behind games like Flow and Flower. Both games focused on the experience instead of the "end" as an objective. Flow could go on forever as long as you were happy growing your creature and eating smaller ones. Flower was simply beautiful, with all these different secrets to be uncovered with every play-through. And that brings us to their latest creation - Journey. And man, what a game this has been for me! 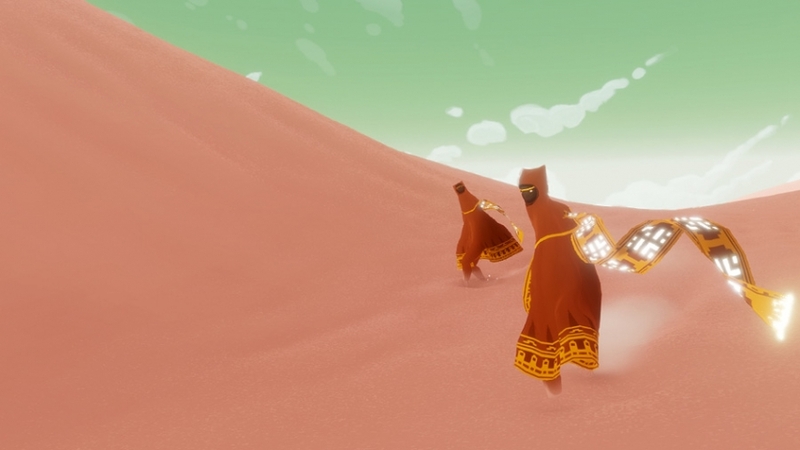 Journey is the third release by Thatgamcompany as part of a 3-game deal with Sony. The game was directed by Jenova Chen, who is the man who has been steering all these fantastic games. 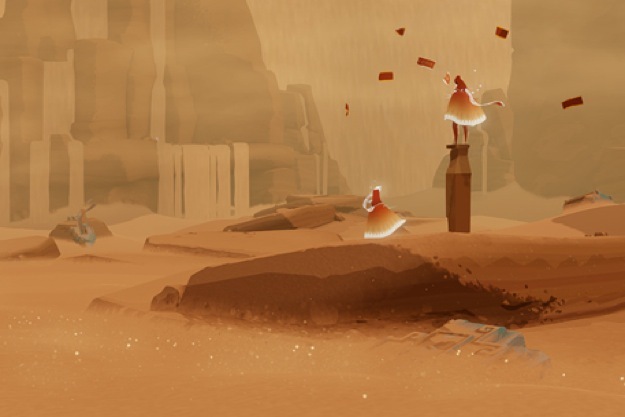 In Journey, you are a mysterious robed figure in the desert. In the distance is a mountain that appears to glow and it becomes your default destination given the practically featureless plane around you. In the beginning all you can do is walk and trigger a whistling chime but in time you'll discover the ability to jump and essentially fly for short distances, something which can be increased over time. What makes this game different from past ones is the fact the developers finally managed to include an online component. But instead of giving you complex co-op options and such, all you can really do is whistle at the other person and see what happens. You will have no idea about who the person is. There is no other way for you communicate clearly. Heck, you don't even have to stay together - it's all up to you! And thus it really does feel like you've encountered another silent stranger in the desert and the two of you are left to figure out how to deal with one another. It's interesting how they managed to make a desert landscape visually impressive and still quite beautiful. Apart from a few ruins here and there that obviously help the story along, the game helps you appreciate the silence of the desert and the rolling of the sand dunes in the wind as you make your way to the far-off mountain goal. Match all this with a beautiful musical score and you have quite the experience in the making. Don't expect the game to blatantly tell you what needs to be done in big glowing letters. Instead you're left to puzzle through the chapters - at least until a stranger comes along and decides to possible help you. And as you play the game over and over (which you're bound to do), then I'm sure you'll find yourself considering whether or not you want to help out other folks as well. The game may seem overly simplistic, but it's in that very simplicity where the beauty of the game is to be realized. 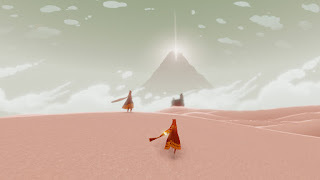 And despite the fact that this game has probably the clearest narrative of the three released by this company, you're still going to be left wondering what the heck is going on and why you have to make your way to the mountain at all. The game truly is a journey - a chance for you to experience a new world through your PlayStation 3 console and a chance to maybe discover something about yourself. The game's lack of dialog may give you a lot of time to think and of course there's the decision of how to treat other players that you encounter along the way. Journey is a game that is better experienced than just read about in a review like this or some Wikipedia page. You're doing yourself a great service by choosing to get this game - and I strongly urge you to do precisely this very soon. Thus I give this game a full 5 flying ribbon things giving you the power to fly as well.